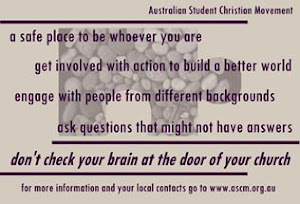 Australian Student Christian Movement Blog: Unsure what an SCM is? Unsure what an SCM is? SCM (Student Christian Movement) is the most commonly used name for the WSCF-affiliated ecumenical student groups who meet in schools, universities and other tertiary institutions to study, work and pray together. Most local Student Christian Movements are ecumenical student organisations that hold regular meetings within a particular university, college or school. Some local movements are denominational student and youth groups which belong to a larger ecumenical association. In some cases an SCM group is an integrated part of the life of a Christian college or Theological college. Local groups operate different models of leadership appropriate to their cultural context. Most groups are led by a combination of people who take responsibility for organising the group's study and dialogue programme, worship life, movement building, finances, outreach and activism. Local movements may belong to a regional collection of movements within their country and all are affiliated to SCM and WSCF through their national movements. To help them to be servants and messengers of God's kingdom in all the world. These aims are interpreted and lived out differently around the world as appropriate to the particular context of each movement. SCMs usually organise their group life around a regular meeting on campus. Often weekly, these meetings may be complemented by special programmes of seminars or open lectures on specific issues, retreats, camps and project work camps, vigils and prayer meetings, Bible study meetings, organisational meetings for political activism, activism events, gender caucuses and joint meetings with other student groups and NGOs. Student Christian Movements are ecumenical communities which form young ecumenists. SCMs gather together young women and men students from diverse denominational backgrounds in a community of peers. In SCM, students negotiate between their different church traditions at a level which is usually only experienced by the clergy and hierarchy of the churches. SCMers regularly work to understand what is shared and what is unique between their traditions as part of working and worshipping together. As a result SCMers often develop a stronger and more focused sense of their denominational identity as well as a sense of personal ownership of their part in the whole church. SCMs are particularly open to searchers as well as to believers and many SCMs include students of diverse religious backgrounds who fully take part in the life and work of the movement. Many SCMs encourage students to understand other denominations by sharing in worship at churches of different denominations. As well as broadening the individual student's idea of the church, these worship experiences help SCMers to understand the traditions of their peers. SCMers are encouraged and fed in their personal spirituality by SCM's open and non-judgemental environment for spiritual exploration. Students share from their personal spiritual journeys and are encouraged to follow many different avenues for spiritual growth including reflection on poetry, creative writing, various forms of prayer and meditation, the dramatic and visual arts, liturgical innovation and much more. SCMs aim to walk alongside students in their own journey of discovery and to help students make their own personal connection to Jesus and his story. Study of theology is a core activity of the Student Christian Movement. Theological questioning underpins the whole life and work of SCM. Students in SCMs are challenged to keep on asking theological questions, "Where is God in this situation? "What have different scholars had to say about this in terms of our Christian ideals and the challenges to action?" "How do we understand what God is saying to us in our context?" Students are equipped to answer these questions with a diverse range of theological input from different traditions, cultures and contexts. Alongside Bible study and social and political analysis, theology is a constant in the programmes of SCMs. Bible study plays an important role in the life of the Student Christian Movement. In SCMs, students are challenged to view the Bible afresh with the same thoroughness and depth they bring to their chosen fields of study. Exegesis and hermeneutics are offered to students as tools they can use to uncover the texts in a new light. SCMers are encouraged to regularly revisit the Bible and the interpretations they have been given, to try and find their own way into the text. SCM members are also introduced to the riches of Biblical scholarship from feminist and women's perspectives, liberation theologies and from a variety of other approaches. Bible Studies are a constant in all SCM programmes to help students make their own connections with the story of God and God's people. Prayer and common worship undergird all the work of the Student Christian Movement. As well as the ecumenical challenges of worshipping together, SCMs offer the space for young people to explore creative styles and forms of worship amongst their peers. SCMers often lead worship, organise whole worship services and write prayers and reflections. It is also common for chaplains at educational institutions and clergy of different denominations to help lead SCMs in the formation of liturgies and liturgical styles appropriate to their ecumenical and student context. The Student Christian Movement is committed to peaceful and just relationships with people of other faiths. Many SCMs visit communities of other faiths, and meet with students from other religious traditions for interfaith dialogue and work on common concerns. Student Christian Movement programmes include the study of cultures, societies and politics with an emphasis on social justice. SCMs are called by the Gospel to pay particular attention to the plight of the poor and marginalised. In the light of the Gospel, SCMs study issues of economics and trade justice, gender justice, globalisation, racism, violence and war, HIV/AIDS, poverty, human rights and environmental concerns and many other issues. Student Christian Movements are involved in direct action on social and political issues. Actions can range from lobbying politicians through letter writing, performing street theatre or making submissions to government through to organising mass demonstrations. Common to all SCMs is a commitment to the education and formation of future leaders in just alternatives to the current political systems. Particularly in the cases of non-violence and gender justice SCM educational work often aims for a fundamental change in cultural norms. SCMs join together with ecumenical and human rights NGOs and other people's movements to address issues of common concern. Student Christian Movements proclaim the Gospel in their work and outreach. Some SCMs focus on traditional forms of direct evangelism while others work on spreading the Good News through their programmes and public profile. SCMs strive to build up the body of Christ through their work and to encourage students and young people to a fuller and more integrated approach to the impact of Christian faith in their lives. SCMs aim to organise their structures and programmes to create equal opportunity for women and men. SCMs are encouraged to promote women's leadership and to maintain a focus on gender justice in their fields of study and action. Each local SCM is affiliated to a national Student Christian Movement. National movements organise the national life through an annual conference and Annual General Meeting. National movements usually organise national or regional programmes on specific skills or issues that require the resources of a bigger grouping than a local SCM unit. 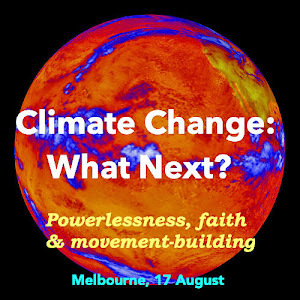 These programmes may include activism projects, theological or issue-based study conferences, work projects, outreach and movement building projects or training programmes. National programmes and projects are often carried out with the help of the Ecumenical Assistance Programme. National movements are commonly run by the Annual General Meeting or general assembly and an National Executive group that meets between AGMs. A General Secretary, Women's Co-ordinator, Programme staff and administration staff may be employed or work voluntarily for the movement. Many national movements publish on the web and produce a national magazine or newsletter. Some national movements have official NGO status with their governments while others operate under threat of persecution. All national movements belong to one of the Federation's global regions and each affiliated national movement has a vote at the World Student Christian Federation's four-yearly General Assembly.